The Associate of Arts in Music prepares students to complete a Bachelor of Music degree in performance, sound recording technology, theory and composition and music education. 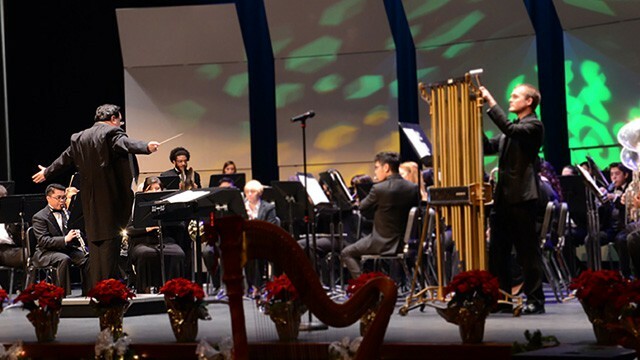 The curriculum at Del Mar College seeks to challenge, empower, and inspire students while meeting their diverse needs as they strive to become performers, composers, educators, and integral members and leaders of the music industry and community. If you are interested in becoming a music major or have any questions regarding any of our programs, contact the faculty member who mirrors your primary interest, as they will best be able to provide you with the information and academic advising you require. For example, if your interest is music performance and/or education, contact the faculty member who provides instruction on your primary instrument. They will serve as your academic advisor during the course of your studies at Del Mar College. In addition, academic advising will also be available on site (The Fine Arts Center) the week prior to the first day of classes, as well as during the New Student Orientation. Faculty will be available to answer questions and provide academic counsel to ensure students register for the appropriate classes. The Del Mar College Music Department welcomes new music students (music majors) during its annual day-long New Student Orientation, held at the Fine Arts Center usually on the Tuesday before the first day of fall semester classes. Students will have the opportunity to meet their applied music faculty and advisor, register for classes, modify their course schedule, check out instrument lockers, and take the Music Theory Diagnostics Exam. This test is designed to assess an incoming student’s musical pitch and rhythm reading and basic musical notation. More information about this test is included on the following pages. All instrumentalists at the college need a place to store their instruments when they are not being used for a rehearsal or individual practice. Lockers are provided for all college musicians and will be checked out during orientation. We will also be providing new students with a tour of the Department of Music Facilities. All students attending New Student Orientation will be divided into one of two groups to get their lockers as well as their facilities tour. Results of the Theory Diagnostics Exam will be posted. If a change is needed in your schedule based upon the results of your Theory Placement Exam, we can help you make these adjustments at this time. Any student may choose NOT to take the Music Theory Diagnostics However, in doing so, you are opting to take the music foundational courses, Music Fundamentals (MUSI 1301) and Class Voice (MUSI 1183). The exam consists of three parts, the written theory, dictation, and sight signing Students who pass with a 70% or higher on all parts of the exam will take Theory I (MUSI 1211), Sight-Singing/Ear Training I (MUSI 1216), and Piano I (MUSI 1181). Students who don’t pass all parts of the exam will take Music Fundamentals (MUSI 1301) and Class Voice (MUSI 1183) to prepare them for Theory I, etc. The Music Theory Diagnostics Exam should be taken prior to your first semester of music classes and may only be taken once. If a student cannot or chooses not to attend the Department of Music New Student Orientation, the exam can be taken at the Testing Center, open Monday-Thursday, 8 AM-5 PM, Friday 8 AM-12:30 PM. For further information on this testing option, please call Anna Villegas at the Testing Center (698-1645). If you have reregistered for Theory I (MUSI 1211), Sight-Singing/Ear Training I (MUSI 1216), and Piano I (MUSI 1181) and do not pass the exam, faculty within the Department of Music will help change your If you attend New Student Orientation, this will take place that same day (see schedule). Students who take the test it the Testing Center will need to make an appointment with their advisor to make the appropriate schedule changes. The theory diagnostics exam is not a measure of your innate musical talents, skills, or study habits. Every student has different degrees of musical experience and this exam intends to place students in classes that will ultimately lead to their successful development as a musician and student, regardless of past music education and experience. Melodic dictation- Identify the contours or shapes of melodic lines. Students are encouraged to prepare for the exam by using any number of ear training software programs such as Practica Musica or MacGamut. These programs will help prepare students for all parts of the exam through various exercises that consists of interval identification and spelling, notating and identifying scales, as well as ear training exercise such as melodic dictation and rhythmic dictation. If you have further questions about the exam, please contact your major advisor or Dr. Roger W. Petersen at rpetersen@delmar.edu. Page last updated December 18, 2018.